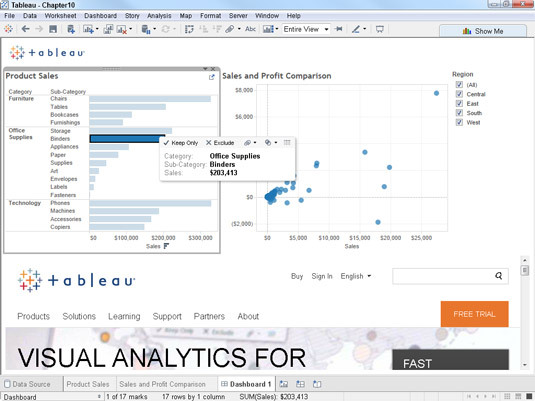 Actions allow your audience to interact with your Tableau visualizations, encouraging them to explore and gain insights. For example, you might include an action that enables users to filter the data on the dashboard by selecting marks within a view. 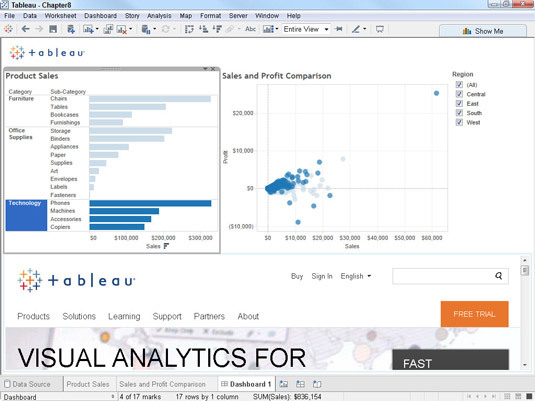 One of the handiest actions that you can add to a dashboard is to use one of the views as a filter for the other views. That way, users can simply choose one of the marks in that view to see the effects reflected in the other views. 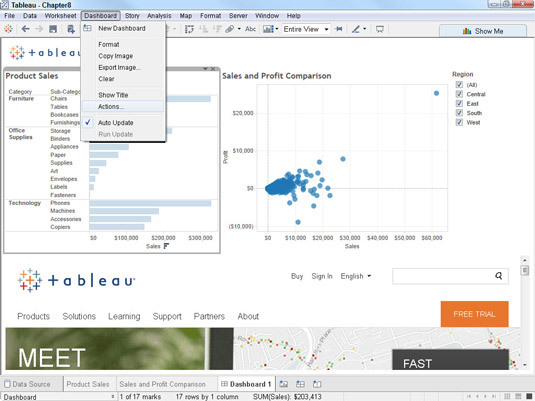 Right-click the view that you want to use as a filter to display its contextual menu. Choose the menu’s Use as Filter option to create the action. Click one of the marks in the view to filter the other views. Choose a mark to use as a filter. Click below the axis to remove the filter. You can also click on the mark again to deselect it, or on any space without a mark. 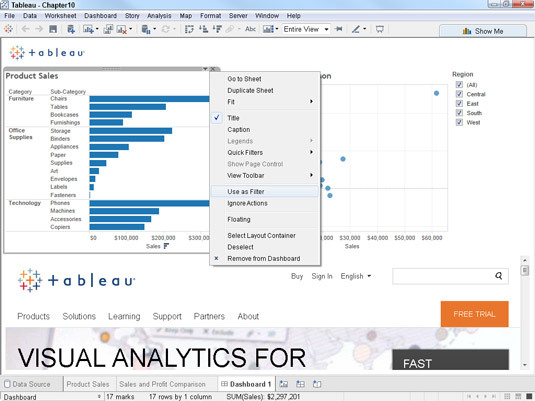 Choose Dashboard → Actions from the Tableau main menu. Add additional actions to the dashboard. In the Actions dialog box that appears, click the Add Action button to display the types of actions you can add. Choose the type of action you want to add. 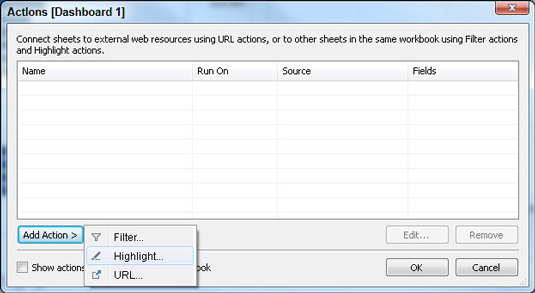 In this case, click the Highlight item to display the Add Highlight Action dialog box. Choose how you want to trigger the action by selecting Hover, Select, or Menu. In this case, check Select. Select the check box in front of the views that you want to trigger the action. In this case, select them all. In the Target Highlighting section, specify which fields to target with highlighting. In this case, select Category. This implies that when you click on a particular category in the Source Sheet (Product Sales) it will highlight the chosen category in the Target Sheet(s) selected (Product Sales and Sales and Profit Comparison). Click the OK button to close the Add Highlight Action dialog box. Test your action by using the trigger that you selected in Step 4. Here is the result of the triggering action. 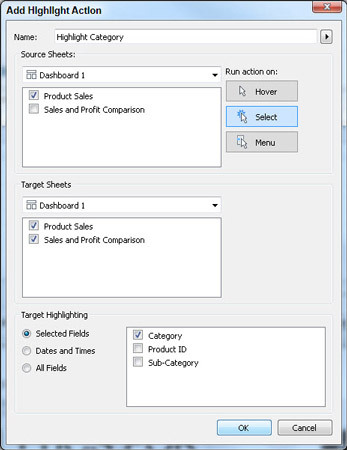 In this case, the user clicked on the Category “Technology” in the Souce Sheet (Product Sales), which caused the field(s) targeted (Category value of Technology) to be highlighted in the Target Sheet(s) (Product Sales and Sales and Profit Comparison). The results of triggering the Highlight action. You’ll probably need to experiment a bit to get exactly the results that you want. If you need to edit an action, open the Actions dialog box as discussed in Step 1 and then choose Edit.